If you play a lot of games, you already know that sound and a decent microphone are very important, but should they come at a cost of an arm or a leg? I don’t think so, so I came up with the list of best budget gaming headsets you can buy in 2018. 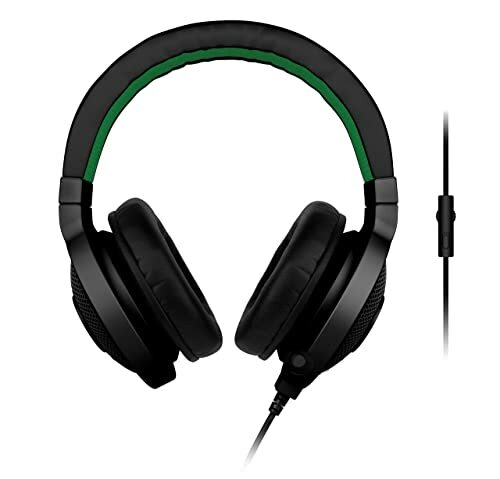 Many companies like Razer, Logitech, Sades and Turtle Beach are trying hard to push their limits on the manufacturing level to come up with the inexpensive gaming headset, that not only provides the premium features but also the long-lasting quality to the gamers. 4 Conclusion: What is the best budget gaming headset? 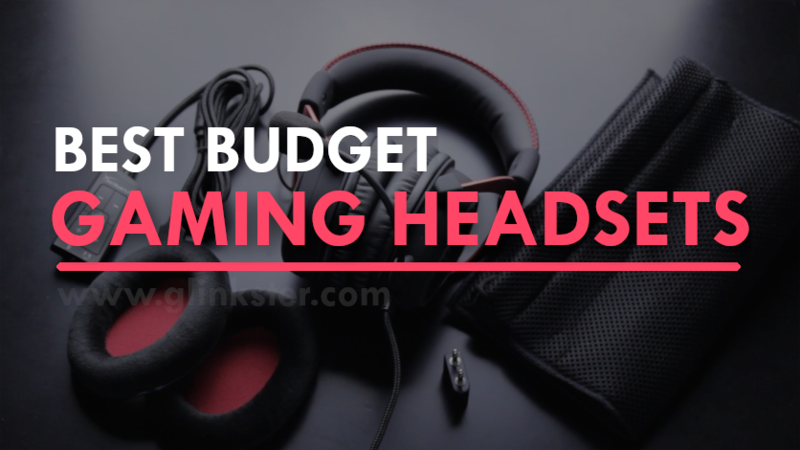 Keeping in mind all the needs of the gamers especially the budget, I have rounded up the list of best gaming headsets under 50$ and 100$. These headsets are perfect options for budget gaming and home use. Recommended: Need the best gaming microphone? We have searched the market and found the best gaming mic for all budgets and needs. Below I have reviewed some of the best gaming headsets you can buy in under $50 budget. I have also enlisted the pros and cons of the individual headset to make you understand even better about each of them. 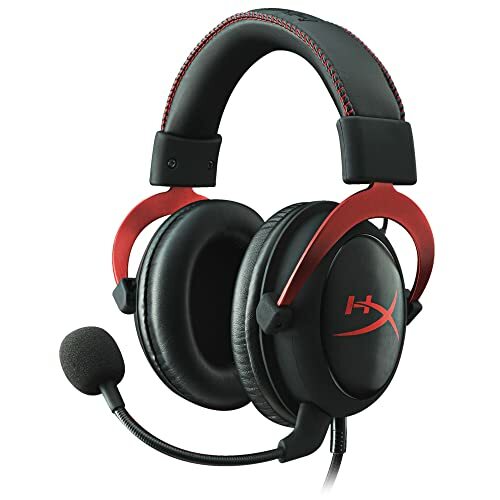 The first product in the list of best budget gaming headset is HyperX Cloud Stinger. It works for PS4, Xbox One, PC, MAC, phone and almost every device. The design of the HyperX Cloud Stinger is very simple. Actually, the only buttons on this headset are on the bottom of the right ear cup and that is where you find your volume rocker, you just have to slide it to adjust your in-game volume. The thing I like most about this gaming headset is its light-weight, in total, it is just 275 grams. Don’t be too rough with this headset like stretching it over during the gameplay because of its plastic construction. But overall it feels pretty nice when you wear it on top of your head especially the ample padding on top of the headset helps it stay nicely on the head. These headsets have 50mm directional drivers which concentrate all of the incoming sounds directly into the ears with most accuracy and gaming-grade sound quality. The ear cups of this gaming headset can be easily rotated up to 90 degrees, that actually helps if you have to put them flat on your gaming desk or just hang them around on your neck which actually is a fashion nowadays. Before I sum up the review, let’s talk about its microphone quality. The microphone is very flexible, it is made up of rubber so you can adjust it easily wherever you want. If you want to mute the mic all you have to do is to tilt the microphone up to 90 degrees, there you go, your mic is muted and to get it back to unmute state, just tilt the microphone down. Now in terms of sound quality, which is actually an important aspect of any gaming headset. I must say the company did a commendable job, they have provided the same sound quality in this 50$ cloud stinger gaming headset which they are providing in their expensive Cloud Stinger 2 headsets. The installation part is very easy, you don’t need any external software or driver to put them on work on your device, all you have to do is just plug them and they automatically start working. This is not a USB headset as it comes with a 3.5mm jack and that is why you can plug it into any device. I personally hand down to its stereo audio quality, one of the best I have heard recently at such a low price. It is really hard to stress that how much the great deal it is under 50$ gaming headset. Understand this as you are spending less than a video game. 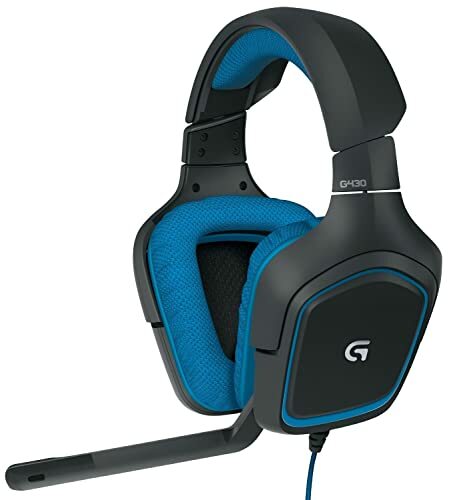 Logitech G430 is the premium headset because it comes with the integrated sound card, giving it a 7.1 surround sound in software capabilities. The company is using Dolby technology that is definitely the better solution out there currently in the market. But in terms of actual headphone themselves, there hasn’t been much that has changed. G430 got the wide headband with narrow looking soft and squishy pad. When you press the pad, you can see the slow recoil which makes it comfortable when you put them on top of your head. The ear cups, on the other hand, do use a harder foam, but it is quite deep. So what you discover with headsets like this, they might not be instantly the most comfortable headset but they sure going to improve over time as they mold to your shape of the head. These headsets have metal adjustments that make them more durable, unlike plastic adjustments. It has got a nice blue graded high-quality cable. The thing that blew out my mind is instead of integrating the USB connector directly into the headphones, they have provided a separate connector, that’s awesome. All the inline controls on the wire itself are very simple, you have got a volume control wheel on the side with a mute button. I personally would be more than happy if Logitech G430 provides the automatic mute feature when tilting the microphone upside to 90 degrees. The microphone is not that adjustable as it is a boom mic, but you can rotate it up and down and it also has a capability to bend right and left a little bit. Kotion Each G1000 is definitely a good blend of fantastic looks and amazing sound quality. It is compatible to PC and Laptop, but to make it work for Xbox One and PS4 you would be requiring a 3.5mm audio adapter. The 50MM magnetic neodymium drivers located in the headphone can convert electrical signals into the sound wave more accurately. Because of that, there is much more sensitivity in terms of picking up the fewer frequency signals. In addition to that, it has an omnidirectional mic which picks up the sound from all around with the same gain. It doesn’t matter whether you are speaking in front, back, left or right side of the microphone, it will record your voice with the same gain. When it comes to ease and comfortableness, Kotion G1000 has a built-in controller on left ear cup with an on-off button for the microphone. Both the ear cups are covered with leather pads to provide the comfort and light-weight enjoyment for the user. As far as the cable quality is concerned, its Velcro cable quality makes sure that the cable management is simple and the wires don’t get tangled. Coming onto the design of this headset, it has a good design, it definitely got the aesthetic looks because of its integrated RGB LED lighting. These RGB lights capture the emotion of the game and reflect the corresponding color. And this is one of the features that differentiate its design from rest of the gaming headsets available in the market. 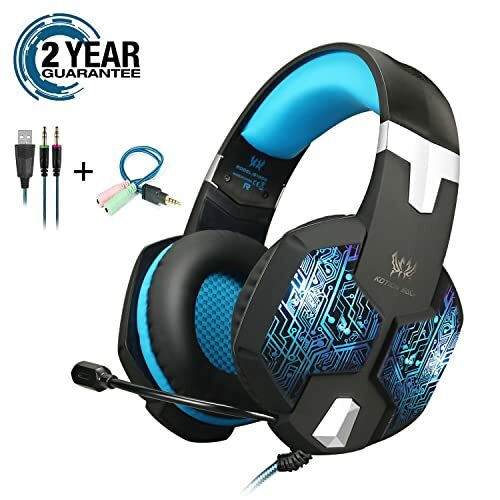 Overall, with an awesome quality surround sound and attractive look, this headset perfectly qualify for the cheap gaming headset available in the market. First and foremost Sades A60/OMG headset is not compatible with any of the console and mobile devices. They are specifically designed for the gaming on the computer. For the low price tag, these headsets have a good sound quality better than what I expected. To be very honest, if you are looking for super high-quality sound, it’s not that good, but it is perfect for gaming or voice chat and TV watching. Unlike other gaming headsets, this one got the folded mic, yes, you can fold the mic whenever it is out of use. And to my surprise, it catches the voice properly in its folded position. For those who enjoy long hours of gaming surely can feel the utmost comfort, because these headsets have proper light padding all around the ear cups and just because of that you won’t even feel any weight when you are wearing them on top of your head. It has got all the controller options on the headset chord itself which I find pretty much easy to operate. Something you should consider before buying them is they have the LED lighting on the sides which you cannot turn off, so sometimes these lights can be super bright at night and cause the eye irritation. The connecting USB chord is durable, sturdy and tangle-resistant because of the good fabric material. Overall, this is worth the price you pay for it, with its aesthetic look to the ease of wearing, it definitely is the good purchase for the gaming headset under 50$. The next headphone in the best budget gaming headset list surely gonna take your gaming to the next level, it is Turtle Beach Recon 50X. It comes with the detachable mic, it means you can take out the microphone anytime you want while watching movies. Isn’t that great? Surely it is. As I was playing battlefield game having these put on, I can tell you, I was hearing every little bit of sensation I can hear of. So these headphones really got a good sound capturing capabilities. On top of that, I am also quite impressed with the noise canceling feature, it gives you pure noiseless environment. It offers a versatile compatibility with the Xbox One, PS4, and the devices with a 3.5mm connection. it incorporates 40mm speakers for the high output sound signals for the better tracking of even the low sounds. The inline mic on-off controllers are right on the place where you needed them. 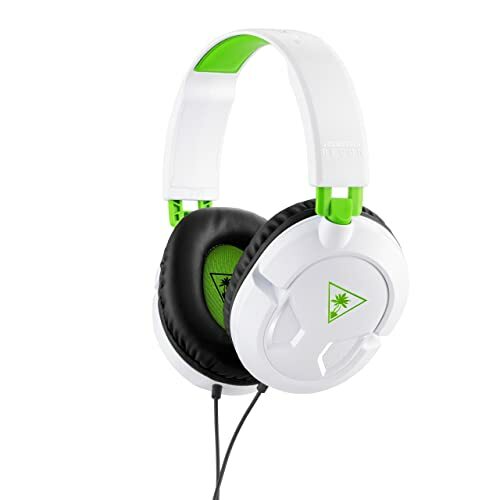 Overall, you can enjoy long hours of gaming with so much ease and comfort with these headsets. I recommend these headphones to all who don’t want to spend a big amount of money and want good quality features. What if I tell you that you can buy a branded gaming headset under 50$? How you react to that? 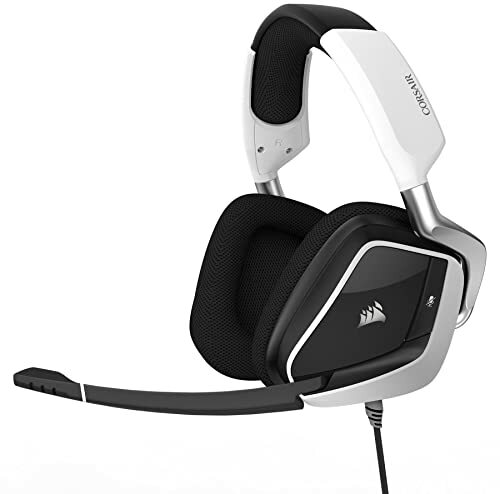 well, I am not joking, the headset that I am just going to review is the one which comes with a brand value and it is none other than Corsair HS50. It comes with the metal construction which automatically gives it a long-lasting durability. These headsets come with adjustable memory foam ear cups that helps you to enjoy long hours of gaming, keeping you fully occupied within the gaming aura. Taking into account the sound quality, it comes with custom 50mm neodymium speakers drivers which are self-sufficient to make you attentive to every small beat in the gaming session. Again, these headsets are pretty much easy to operate because of the availability of the on-ear volume and mute controls. You can expect a crystal clear sound from the microphone. The microphone is unidirectional in nature and has the good capability to cancel noise from all around. Being discord certified, this headset promises to provide the outstanding voice quality. The stuffed cushions on the ear cups make this headset more comfortable and light-weight as compare to the other gaming headsets in the list. Like Turtle Beach Recon 50X, it also has a separate microphone which you can attach and detach anytime you want. As far as the compatibility is concerned, it offers versatile compatibility with PC, Xbox One, PS4, Nintendo switch, and mobile devices. Overall, it is one of the top picks in the list of cheap gaming headsets when it comes to the durability and trust factor. After doing the testing of many headsets, I came up with the list of top gaming headsets you can buy in under 100$. All the listed headsets have something to offer in terms of features, but in the end, you have to decide which one works better as per your needs. Razer’s Kraken Pro is the perfect choice for the stereo headset for all the gamers who want a simple solution for their gaming and voice chat needs. It is a wired device which perfectly delivers the quality sound for all type of gaming. The build quality of this headset is very nice, It is made up of the perfect blend of materials at this low price. Keeping in mind the comfort level, the top of the headset is covered with the soft leather material and has “Razer” carved into the headband. The underside part of the headset is soft and coated with a light sheet of memory foam. The weight of the Kraken Pro is 322g which I think is heavy and sometimes also feel uncomfortable. These headphones are height adjustable, so it can provide more options to the different head size. I personally thank Razer for the strong grip on the head, sometimes what happens is, you give a little movement to your head and the headset falls off, so I prefer strong grip which you are getting in Razer’s Kraken pro. Is Kraken Pro a durable headset? Yes, it is. The sides of the headset are well attached with the metallic frame, and it’s ear cups are built with the blend of metallic mesh and textured plastic. The microphone of this headset is retractable, it can be easily adjusted giving you the flexibility to operate it faster. The controller on the chord itself is fixed and are not replaceable by the user. These headphones have got some amazing sound quality because of the 40mm speakers’ drivers, they are more than sufficient to fully immerse into the gaming environment. But these do create a lot of bass and vibrations when I do listen to some music apart from gaming which I don’t like. Should I buy the Razer Kraken Pro V2? Yes, Kraken pro is a top-notch gaming headset which delivers a perfect sound quality and comfort enough to enjoy long hours of gaming. I want to buy a branded gaming headset, if that is what you have in your mind, then no one can beat SteelSeries. SteelSeries already dominating in the gaming industry, whether it be mice, keyboards, or headsets. So without a further ado, let’s review their inexpensive gaming headset, the SteelSeries Arctis 3, which you can buy in under 100$. Arctis 3 has a very sleek and stylish design. They come in different colors, you can order them as per your preference. These headphones are not at all bulky and heavy, moreover, I find them pretty comfortable in wearing. All the controls such as volume controller, microphone mute button are available on the left side ear cup. The microphone comes out from the ear itself and you can simply pull it back when not in use. When it comes to comfort no one can beat SteelSeries. I highly recommend you buy this headset if you feel uncomfortable in your current headsets while playing long hours of gaming. So far, the Arctis 3 is the most comfortable headset in the best budget gaming headset list. All thanks to their great elastic headband design. Expect super high-quality customizable sound. Yes, you can customize the sound of the headset according to your needs through their SteelSeries Engine 3 software, which works better on PC. In just 80$ SteelSeries Arctis is offering 7.1 surround sound. What you can expect more in a headphone that cost you cheaper than 100$. I personally rate 10/10 in the sound category to this headset. If your only intention is to play games, then you can trust the quality of its microphone, but it’s not that good when it comes to recording podcast videos and youtube streaming. 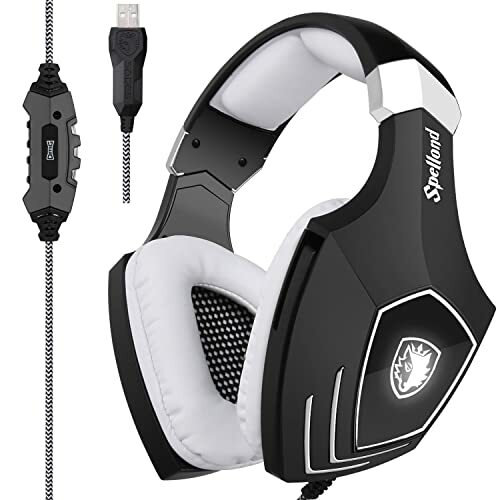 Overall, SteelSeries produced yet another top quality gaming headset which stood very well on all the selection criteria of best gaming headset under budget. And yet again, I have been completely blown out by the customizable features the next headset offers in the list of affordable gaming headsets. 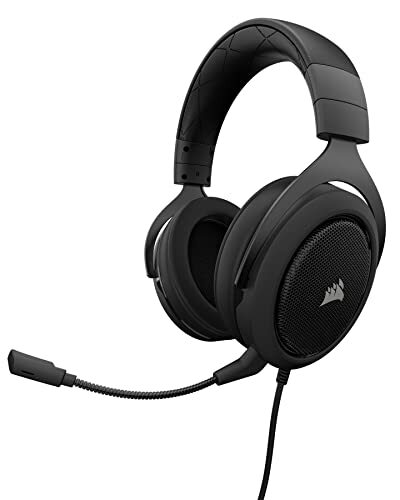 Corsair void pro RGB USB offers the professional gaming sound quality and this headphone has all the features you can get out of a good quality headset. This headset does come in many different forms including wireless if that is your preference, but here I am only reviewing an RGB version comes in under 100$ budget. With the Pro version, you get softer foam on the ear cups, some more upgradations to the 50mm drivers and a slightly better microphone as well. Firstly let’s talk about the overall design of the headphone and I must say Corsair has executed very well in terms of design. This headset has D shaped ear cup design which fits very well around the ears, but unfortunately, the clamping force is non-existence. For a moderate size head, I find these way too loose. The headband is adjustable, but I couldn’t get the perfect size even after adjusting it many times. For long gaming sessions, I can easily say these headsets perfectly fits after some time. The build quality is superb and I could easily say these lasting for a few years at least. Adjusting the headband is very pleasant and I can appreciate the easy rotation of the ear cups allowing headsets to stay flat when not in use. The cable of these headsets is not detachable which may annoy few of you for example if you like to upgrade to a shorter or longer braided cable you are basically out of luck here. Now, of course, we are getting RGB which takes effect on the Corsair logo on both ear cups. We can customize the lighting effect through Corsair utility engine. There is a mute button on the left ear cup which does illuminate when the mic is muted. You do have a volume switch underneath the left ear cup through which you can also toggle to your EQ presets. Before I talk about the virtual surround sound, let’s talk about how this headset sounds in general. The sound signature of the void pro is warm with plenty of basses, which is prominent and well balanced. Now here comes the role of EQ presets, you can easily customize the sound needs according to your likings. Now let’s talk about microphone quality because this is something either miss or hit when it comes to all in one gaming headsets. I think with the rest of the headset being so premium in terms of design and sound quality, the microphone is holding it back quite a bit. But at this price tag of under 100$, it is acceptable for some casual gaming. The microphone does come with a windshield which reduces the noise of breathing in intense gaming. The mic arm is perfect in my opinion, its movements are smooth. One of the major marketing features it holds is the inclusion of the Dolby 7.1 surround sound. Overall, Corsair void pro offers quite a lot for only under 100 dollar price. The comfort and weight of the headset are very good and the sound quality is absolutely amazing. 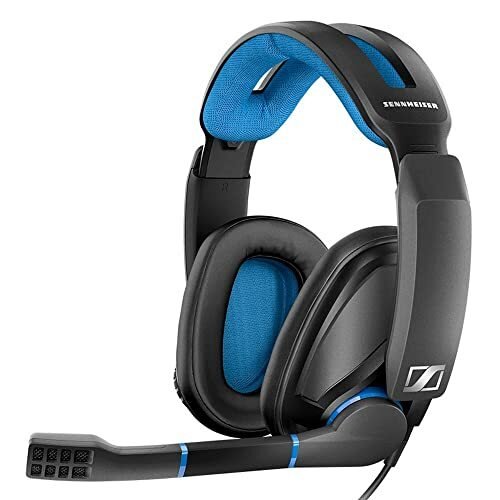 Sennheiser focuses this product on the main-stream budget category. So let’s see what exactly are the changes company made in GSP 300 compare to the expensive category headsets. The headband of the headset is double wide with nice padding and the sides adjustable are solid in position. The overall clamping force with light frame makes this a very comfortable headset. One of the most impressive elements of this pair is acoustic isolation, the leather-like padding is excellent in-depth plus having internal structure angled to fill the ears better, but the sound isolation is absolutely incredible. You can easily feel the zone out environment which actually is positive for gaming, you cannot literally hear anything outside the headset, it is perfect for competitive concentration. The ear cups are similar in size as of Game one headset but have slightly different shape, a little angled to provide the better noise cancellation. I do love the volume wheel on the right side that has the slight resistance and feels so much better compared to the volume controller on other gaming headsets. The mic can be easily muted & unmuted by simply rotating the microphone up and down which is much more convenient than the button on inline remotes. The microphone is not flexible at all, you cannot take it near to the mouth as it just stays in the one position. The sound quality of the microphone is good, it’s not muffled. But the only thing is the volume picker is much lower when compared to the other gaming headsets under in the same price tag. Overall, for the sound wise, it’s 99$, it’s awesome. The comfort fit is good, the microphone is excellent, there is cable noise, but only if you pull it harder. It certainly fits the best on your head as compared to the other headsets in the list. What makes the HyperX Cloud II so awesome is that not only it does feature metallic frame, but also all the side adjustments and ear cups are built with aluminum, they are tough and not going to damage so easily. Considering the design of it, you have nicely stitched black and red ribbon on the top and soft foam for the comfort in long gaming sessions. It comes with the leather ear cups which I personally like because I don’t like the fabric feel of the ear cups on my ears, it feels itchy. Moving further ahead, they don’t have detachable cable at all from the headphone itself, but the microphone is detachable. Why would you want to detach your mic? It’s because of there a lot of people from the school, colleges, universities and all of them want a one set of headphones that are versatile, they can do everything they need, they can play music, they want to chat and this headset will go with you wherever you go and for that you need one set that can do everything. There is a dongle on the cable which does have a clip, the end of the cable terminates into a USB 2.0 which goes into your PC, but let say you want to use these headphones on your mobile, then all you have to do is to just detach the microphone dongle and there you go, you can use it as a stereo headset now. And this entire thing adds up to the modular aspect of this headphone. The inline control systems do have a slider and a mute button on the side, but it also has the volume up and down for both microphone and headphone which is pretty cool. It also has an option of 7.1 surround button which turns this into a simulator 7.1 which actually is not that bad, I have tried that out in a battlefield game, the moment you press it, the gaming environment seems to go from pretty close to very expanded. The best thing about these headsets is that you don’t have to install any external software, all you have to do is to just plug them and start playing. Once again the Kingston has definitely hit a home run when it comes to rounded gaming headset that doesn’t destroy the bank and gives you a lot of features. Conclusion: What is the best budget gaming headset? 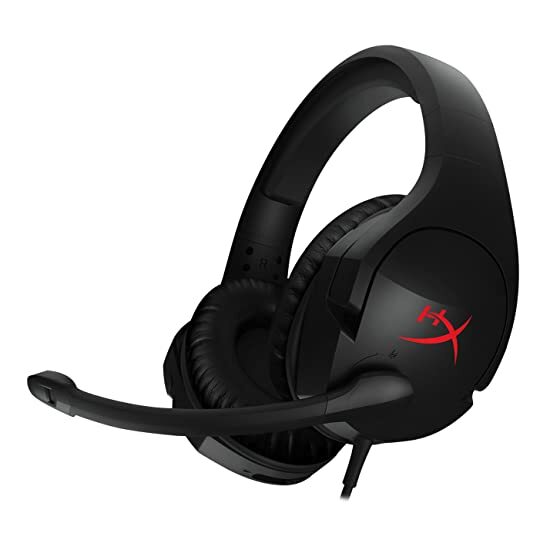 Considering all the important things in mind especially the budget, I can easily say the HyperX Cloud Stinger is the best budget gaming headset on the market according to me. 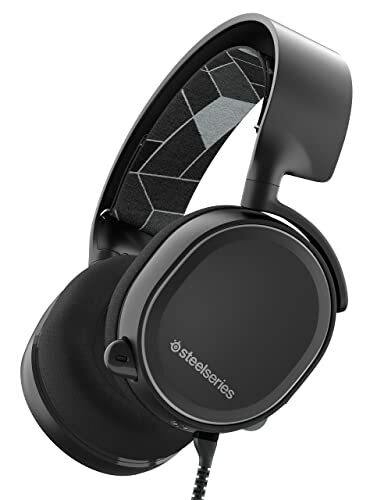 But in case if you have slightly more budget to spend, then SteelSeries Arctis 3 would be your first choice for the gaming headset under 100 dollar. That’s all from my side, if you have any questions and doubts to ask, just leave them in comments, I am more than happy to answer them all. Follow Glinkster for more future updates.